Do you work on several files both at home and at work? Do you have trouble remembering where is the latest version of your files? Do you sometimes forget to copy the files you need to take home to your flash disk? Would you like to keep these files in sync automatically between your computers and flash drive? Flash Synchron will allow you to automatically synchronize data between one or more computers and flash drive. You can synchronize several files and folders from different locations using one flash drive. Since he found Flash Synchron, he does not have to worry about copying the files at all. · Remind to synchronize the files before flash drive is removed. Option to ignore time difference in files after Daylight Savings Time change. Now Flash Synchron will not overwrite all the files after every DST change. Ability to delete files during synchronization (detect files delete by user from source or target and delete them in all synchronized locations). Global exclusions to exclude files and folders from synchronization based on some text in their path. Resizeable preview window and other minor changes in the user interface. 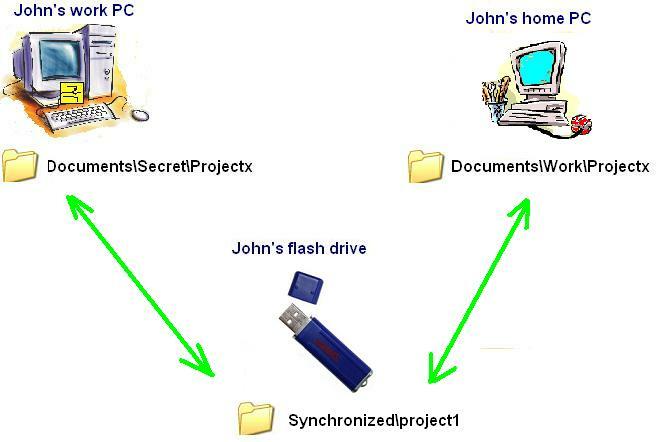 P.S: it is not good idea to carry secret data on a flash drive without encryption, so John should also use Flash Securer to protect his files from misuse. Note that this program requires .NET framework 3.5. If you are using Windows Vista or newer, it will most likely be on your computer already. If not, the setup program will attempt to download the framework from Microsoft website. If you plan to install the program on computer without (or with limited) internet connection and the .NET framework may not be present on that computer, please download it now here. Extract the downloaded zip file (be sure to extract all the files from the zip archive!) and then run Setup.exe. Flash Synchron is freeware. You can use and distribute it freely as long as you do not modify it or distribute it for profit. See license agreement in the program documentation for more information.